Copyrights Asuiku All Rights Reserved. Asuiku, a non-profit organization based in Sendai, Miyagi Prefecture, has been providing educational support for children living in evacuation centers and temporary housing, since shortly after the Great East Japan Earthquake in March 2011. The goal of Asuiku's efforts is to provide children with places to study after school which do not cause financial hardship and are within walking distance for every child. In May 2012, Asuiku started a learning assistance program for children by utilizing online teaching materials jointly with SuRaLa Net, which focuses on online education systems. 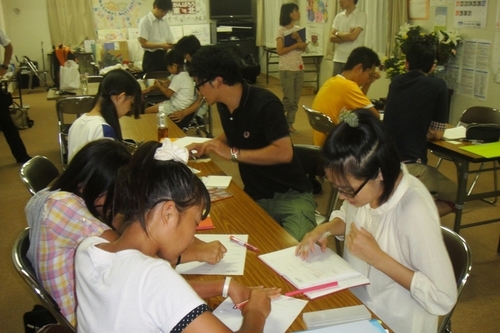 In 2013, Asuiku started securing both venues and volunteers for the project with the cooperation of the Miyagi Co-op. The co-op offers the meeting rooms attached to its shops as a place to study for children of low-income households, and recruits volunteers from among the members of the co-op to help the children study. Asuiku plans to reduce the number of children isolated from society as much as possible in the future by providing places for study and spending time with them.